Kirsty and I are joining a bunch of peeps who are starting this bible reading plan this week. Wanna join us? This post was stolen (borrowed) from my mate Dave. I’ve been doing the same bible reading plan for the last 4 years. It’s time to mix it up a bit! So starting on September 1 I am beginning a 12-month reading plan written by John Stott. John Stott, who died at the age of 90 in 2011, is one of my favourite authors. I appreciate his clear, compelling and Christ-centred writing. His commentaries in the Bible Speaks Today series have been a particular help in preaching. The new reading plan is from a book Through the Bible, Through the Year with ‘Daily Reflections from Genesis to Revelation.’ Stott is the legend flossin the blue tracksuit and bird-watching binoculars in the pic below. Doing physical exercise is often easier when you do it in a group. Likewise with spiritual exercise. A number of people have already indicated they’re keen. If you want to join in, let me know in the comments below. If you’re not sure, perhaps you could do the first two weeks for free and then make a decision. 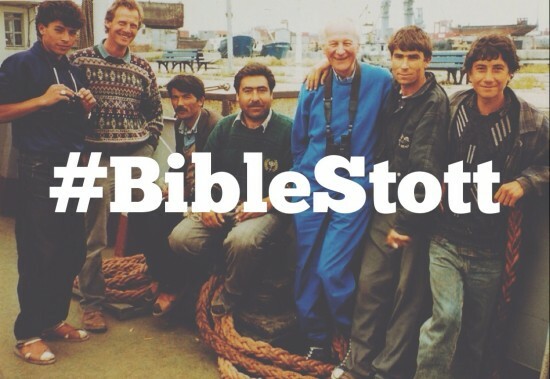 If you use Twitter, Facebook or Instagram – use the #BibleStott hashtag when sharing Bible verses or reflections of what you’re learning. This week at church we finished up a two week series with John Woodhouse, on ‘The Christian and God’s Law’. These two talks were outstanding, have a listen if you want.